(L-R): Shig Yokote, Norman Kamada, Frank Kageta and Mack Tsujimoto. 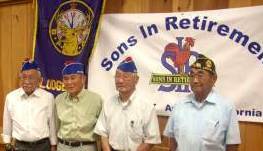 On Thursday afternoon Branch 37 of the Sons in Retirement (SIR) recognized four Japanese-American World War II veterans for their service in the 442nd Infantry Regiment. Decorated veterans Frank Kageta, Norman Kamada (Poston camp 3) and Shig Yokote were the honored guests at the SIR’s monthly luncheon meeting at the Elks Lodge in Auburn. Each of these men has received a variety of honors and awards, including the Good Conduct Medal. The Sons in Retirement also welcomed Mack Tsujimoto, who served as a medical technician in the United States Army Air Forces in the Pacific. He continued this work in Japan for a year immediately following the end of the war. Granite Bay native, Jerry Lewelling, who orchestrated the event, introduced the four men. He then showed the 2005 documentary “Going for Broke.” The film outlined the role of Japanese Americans in World War II from their forced evacuation into internment camps to their service in the 100th Infantry Battalion and 442nd Infantry Regiment. After the film, Kageta spoke of his experiences in the 442nd. Kageta, Kamata, Yokote, and Tsujimoto received standing ovations from the SIR members, many of whom are veterans themselves. Kageta noted that during his service he was never particularly concerned about being part of a segregated unit. Instead, he was focused on following orders, a mentality that he remarks has served him well and continues to be a central value in the military today. “If you’re told to do it and you’re disciplined, then I don’t think we have to worry about this country,” he said. The SIRs presented certificates and commemorative medals to each of the veterans.